The nearly 70-year-old tampon brand innovates with all-new responsibly sourced organic cotton tampons available with or without a Tru-Comfort™ plant-based* applicator made from renewable sources. 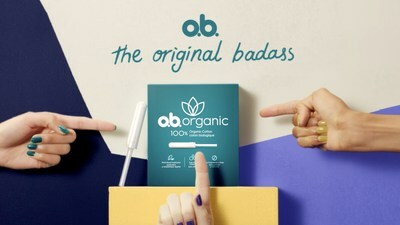 SHELTON, Conn., April 9, 2019 /PRNewswire/ -- o.b., the original progressive tampon brand designed by a woman for women in 1950, today announced the launch of o.b. organic, an all-new product line of responsibly sourced, 100% certified organic cotton tampons from tip to string. For the first time, this new line from o.b. is also available with or without a Tru-Comfort plant-based* applicator—the only o.b. tampons to offer an applicator—made from renewable sources. For nearly 70 years, o.b. offered applicator-free tampons, which meant one less applicator to a landfill or the ocean, making the brand environmentally conscious before the ecofriendly trend. With o.b. organic, the brand is offering another great choice for women who don't want to sacrifice protection for sustainability. All o.b. organic tampons are free from chlorine, dyes, pesticides, fragrances, and BPA, giving women only what they need and nothing they don't. "For decades, o.b. has strived to introduce sustainable, effective solutions for periods," said Devon Driscoll, brand manager at Edgewell Personal Care. "With the launch of o.b. organic, we are excited to now offer women 100% certified organic cotton tampons along with an innovative plant-based* applicator option. We at o.b. were committed to making an applicator that is in line with our commitment to sustainability." To promote the launch of the new o.b. 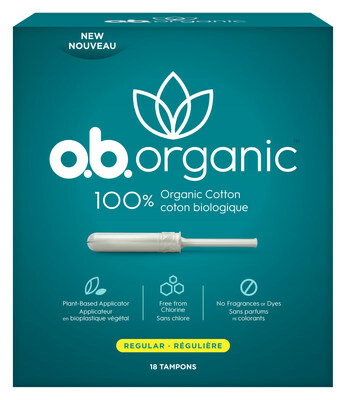 organic tampons, o.b. is rolling out its largest creative digital advertising campaign in years. Playing off the brand's name and heritage as the original progressive choice in feminine care, the Original Badass campaign celebrates the brand's badass reputation. Original Badass aims to refresh the brand that already has high consumer awareness and modernize it to reach a consumer who doesn't accept things at face value and refuses to accept someone else's standards. As part of the campaign, o.b. acknowledges that no applicator is the best applicator—dubbing a woman's finger the Original Badass applicator. But, for those who need a hand, o.b. organic's plant-based* applicator is second best. The campaign launches today and runs through the end of the year. o.b. organic tampons are now available in Regular and Super Absorbency with an applicator (MSRP $6.99/18ct) or without an applicator (MSRP $6.99/24ct) at retailers nationwide including mass, drug, grocery, and Amazon. Edgewell (NYSE: EPC) is a leading pure-play consumer products company with an attractive, diversified portfolio of established brand names such as Schick® and Wilkinson Sword® men's and women's shaving systems and disposable razors; Edge® and Skintimate® shave preparations; Playtex®, Stayfree®, Carefree® and o.b.® feminine care products; Banana Boat® and Hawaiian Tropic® sun care products; Playtex® infant feeding; Diaper Genie®; Bulldog® and Jack Black® male skin care and grooming products; and Wet Ones® moist wipes. The Company has a broad global footprint and operates in more than 50 markets, including the U.S., Canada, Mexico, Germany, Japan and Australia.